In yet another "anything but CO2" article (archived here, latest update here), Anthony Watts wants to blame all the recent warming in Greenland on soot. He reaches left, right, up and down to get out of carbon dioxide being a greenhouse gas and warming the world. Which is pretty funny when he also tries the "I'm a reasonable man, really I am" tack by posting articles where he pretends that he really does think there is such a thing as the greenhouse effect. What's even funnier is that Anthony is downplaying the role of natural variability in his effort to blame soot for Greenland warming. Anthony is disputing another Nature paper, this one is about attribution of the causes of the very high amount of warming in Greenland and north eastern Canada. Going by the abstract and the press release, the authors have concluded that up to half the recent warming in Greenland and north eastern Canada may be natural variability. These areas have been warming at around 1° Celsius a decade since 1979, which is about twice that of the global average temperature rise. The scientists have found that about half of this (0.5° Celsius a decade) is related to changes in atmospheric circulation over the North Atlantic, caused by a warmer western tropical Pacific Ocean. The world is large, but studies like this show that the world isn't so large that the ocean right down near New Guinea, which is in the tropical southern hemisphere can affect the Arctic, way up north. And at the same time this same area of the Pacific is causing atmospheric waves that are warming West Antarctica and melting the Pine Island Glacier. Anthony doesn't believe it. He wrote about a photo of a pool of water in Greenland, which I traced back to here originally. Anthony isn't talking about the dirty snow in the foreground. He's talking about the dark section of the pool in the shadow. Water Filled Canyon (Greenland) Although snow has dammed outflow from the lake, nearby melt streams continue to fill sections of the canyon where snow has not accumulated. The substantial role inferred for soot in global climate does not alter the fact that greenhouse gases are the primary cause of global warming in the past century and are expected to be the largest climate forcing the rest of this century. ...The darkening in the non-melting areas, says Dr. Box, is due to changes in the shape and size of the ice crystals in the snowpack as its temperature rises. Snow grains clump together, and they reflect less light than the many-faceted, smaller crystals. Additional heat rounds the sharp edges of the crystals. Round particles absorb more sunlight than jagged ones do. Here is a chart showing overall contributions of humans to global warming. 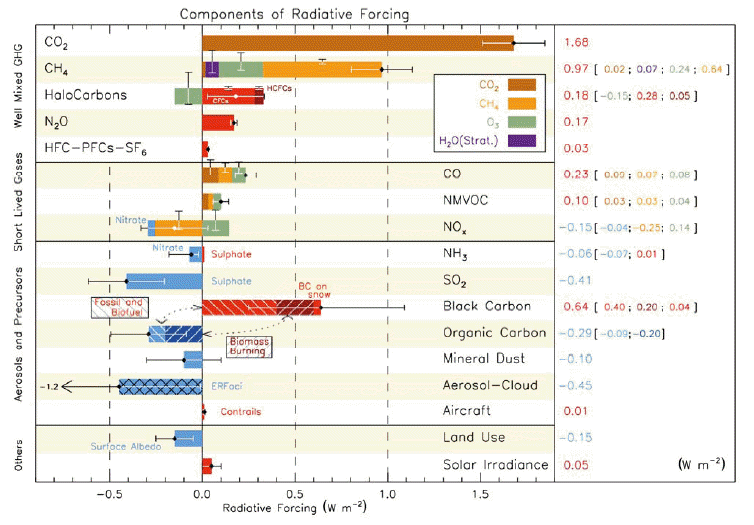 CO2 is by far the biggest followed by methane, but soot plays quite an important role as well. Click for larger view. A couple of other points. Anthony wants to blame the hotter Greenland and north eastern Canada on soot. What about the rest of the Arctic? Is soot not falling there? And is there more soot falling in the Arctic now than it did in the past? I don't know the answer to those questions, but from what I've read there isn't any more soot being produced than there was in the past. If anything, it's decreasing. The really weird thing is that in his focus on soot (much of which comes from human activity), Anthony is downplaying the role of natural variability in the recent rapid warming of Greenland and north eastern Canada, which is what the paper was all about after all. Surprisingly a lot of people are quizzing Anthony on his interpretation of the photograph he showed above. He's not having a good day. What I don’t get is, with all this modelling and VERY (sarc) high climate sensitivity, how is it that there’s still life on earth? Wouldn’t the extintion of the dinosaurs, due to a catastrophic event that obliterated the species, would have caused more damage than mere CO2 <0.04%v/v? Now, I am not sure if the dinosaur extintion due to the meteorite is a fact or theory. But if it is a fact, shouldn't it shed some light on how resilent the climate is? If they’re right, and 1/2 the warming is natural, then that about agrees with the recent lower estimates for sensitivity, and means that the expected 1.5C warming by 2100 is nothing to panic about. So Steig has joined us at last! Anthony, is it ALL carbon soot? Does wind blown glacial dust, or atmospheric dust, also take on a dark color when submerged? Not disagreeing about albedo effect, just wondering if carbon is the only source of dark coloration at the bottom of a melt pool on a glacier. Can someone point to a chemical analysis of the black stuff in that Greenland pond? I’m sceptical that it is ‘soot’. Oh, and where does the red stuff that you see over arctic glaciers occasionally come from? Well done WUWT for finally starting to publish research papers that, like virtually all climate-related papers in Nature, attests to the reality of significant temperature increases caused by carbon dioxide emissions. No soot in the pool ! Just a photograph, low sun angle, shadow and diminished illumination against a very bright foreground on top ! Particulate measured in Firn and glacier ice is at the ppm level. Not enough to make a difference. Stupid question: how do you know it’s soot and not some dark tunnel carved into the ice? To me the dark part looks like a deeper part of the water, i notice that there are no darker parts elsewhere or if it is does the movement of water carry it to one part. The bottom of the picture shows discoloration of the snow- soot? that has melted and yet everywhere else looks pristine. How do they know that exactly half is due to AGW and the other half is the unpredictable part? How did they come up with that figure of 50% AGW ? In a sense they are back peddling from the apocalypse. Now it is only 50% due to evil humans. Last year it was all human CO2. Is it due to highconfidence that the AGW believers have ‘won’ and will see their self-serviing policies imposed no matter the facts? “Neil says: May 8, 2014 at 8:15 am Stupid question: how do you know it’s soot and not some dark tunnel carved into the ice? 1. There is no evidence that this photo shows soot. 2. Its assumed and asserted as fact. That said, soot plays a role. thats part of the human forcing equation. If you want to know how much of a role soot plays you have to run a GCM. or you can just speculate and assert that it plays a major role. Science: build a tool to try to understand the role of soot. Politics: assert that its all down to soot. no comprehensive data, no methods, a few pictures, no testing of the hypothesis.. just assertion. To say that half is natural, not human-caused, is to say that you are a denier (of consensus, IPCC science). It is to say that any action to reduce human generated CO2 will have half the effect of the IPCC scenarios, and kill both the economics and the actual result of what is proposed “must” happen. Sand, M., T. K. Berntsen, Ø. Seland, and J. E. Kristjánsson (2013), Arctic surface temperature change to emissions of black carbon within Arctic or midlatitudes, J. Geophys. Res. Atmos., 118, doi:10.1002/jgrd.50613. I guess Anthony's never heard of contrast. The camera is pointing at an awful lot of white, but is not overexposed. Ergo, everything that is not-white is going to be relatively underexposed, and look darker in the pic than it would in real life. The blue glacial water, in a deeper part, in the shadow of the snout thats pointing at the camera? Going to look black. Or is this woman also covered in soot? Anthony's boy, Evan Jones, has abided by that in his explanation of the Arctic Warming too. That fits in nicely with his upcoming research paper on poorly sited stations. These two are two peas in a pod, believe me. That paper is upcoming, and always will be. So some of the Denialati are latching on to the "50% natural" from Ding et al as proof that the science is overblown? "...recent warming in this region is strongly associated with a negative trend in the North Atlantic Oscillation, which is a response to anomalous Rossby wave-train activity originating in the tropical Pacific." The thing is, the "natural" component of the Greenland warming is itself quite likely to arise at least in part from anthropogenic forcing elsewhere. It's one of the elephants in the paper's room. DO not get out of jail. Do not pass 'Go'. I've just been checking out Tom Harris's website, at climatescienceinternational, and the lies are just astounding. It has this particularly egregious lie. "More recent history, about 1000 to 1350 AD, experienced temperatures of about 2 to 4 degrees Celsius (C) warmer than today"
Sorry guys, but all the recent reconstructions show that during that period, the temperatures were LOWER than today's climate. And then they have another appalling lie. 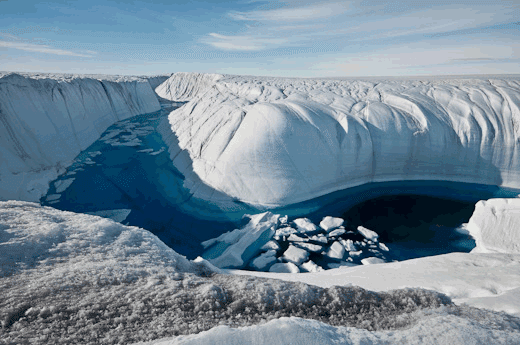 "Fluctuations include global cooling from about 1940 to 1975, followed by warming until 1998. Since then, the earth has actually been cooling again." Where the words 'cooling again' linked to this WUWT post. In it, Watt's has claimed that during 2008, according to GISS, the global temperature fell by 0.75C. The 2008 global temperature fell by about 0.1C, NOT 0.75C, and then went back up again. Is Watt's just utterly stupid or intentionally lying? A Robert Kehoe wannabe perhaps?